Rather watch the video? Scroll to the bottom to see Dr. Nathaniel’s first video. No equipment, instructors or membership needed. No special equipment involved means no extra cost involved! Walking can be done nearly anywhere, anytime. Most of us can just get up and walk and you can go at your own pace! A range of studies shows that physical inactivity increases the incidence of common health complaints, including heart disease, hypertension, stroke, Type 2 diabetes, obesity, gallstone formation and even some types of cancer. Amongst these studies, people who participated in just 30 minutes of moderate activity – such as brisk walking – each day, reduced their levels of risk. This is to do with the fact that our basic human ‘genetic’ make-up has not really changed from 10,000 years ago when a hunter-gatherer lifestyle involving daily moderate physical activity was an essential part of survival. One recent study has shown that walking for 40 minutes 3 times a week can improve connectivity in the brain and even counteract some of the brain declines that occur because of aging. 6. Walking increases aerobic fitness, heart and lung function and aids weight-loss. It’s probably not surprising that a recent study has shown that sedentary, overweight women who actively use a pedometer program to increase activity show improvements in waist circumference as well as health measures such as heart rate, BMI, blood pressure and fasting glucose levels. 7. Walking decreases bone loss. There is evidence to suggest that regular exercise, such as walking, can have a positive long-term impact on an individual’s balance and gait, and may even protect high-risk elderly women from hip fractures. 8. 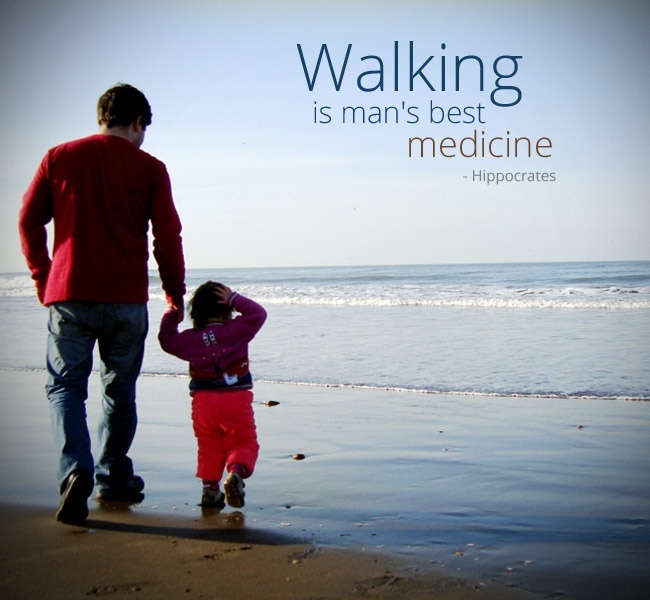 Walking improves blood and lymph circulation. It has been shown that there is a correlation between increased peak fitness, through regular aerobic exercise, and improved blood flow. 9. Improves boosts mood, alertness and energy levels. Did you know that a decline in mental ability and health can be delayed by walking? One study shows that women with “higher levels of baseline activity” are less likely to develop cognitive decline. Other studies have shown that in cognitive testing of elderly persons, better results were achieved by those who were physically active than those who were inactive. Not surprisingly, individuals who undertake higher physical activity levels during their mid-life years, have been found to enjoy an improved health status in later years. 10. We’re here to help! If you find walking difficult or painful, book an assessment with Dr. Paula or Dr. Nathaniel to determine whether Chiropractic can help you get to walking soon. Lacking motivation? Why not walk to and from your Chiropractic appointment, or park a little further away from the clinic? 10 Reasons why walking is the best kind of exercise…If you need help reaching your walking goals give us a call on 87253755 to book an assessment with Dr Nathaniel. If you’re looking for a walking buddy, join us on 10/10@10am as we walk around the lake. Aerobic activity should be performed in bouts of at least 10 minutes in duration. Australian Bureau of Statistics. (2004-2005). National Health Survey: Summary of Results. (No. 4364.0). Canberra, Australian Capital Territory. Booth, F.W., Chakravarthy, M. V., Gordon, S.E., and Spangenburg, E.E. (2002). Waging War on physical inactivity: using modern molecular ammunition against an ancient enemy. J Appl Physiol 93: 3 – 30, 2002;10.1152/japplphysiol.00073.2002. Musto A, Jacobs K, Nash M, DelRossi G, Perry A. (2010) The effects of an incremental approach to 10,000 steps/day on metabolic syndrome components in sedentary overweight women. J Phys Act Health. 2010 Nov;7(6):737-45. Ivey, F.M., Hafer-Macko, C.E., Ryan, A.S., Macko, R.F. (2010). Impaired leg vasodilatory function after stroke: adaptations with treadmill exercise training. Stroke. 2010 Dec;41(12):2913-7. Sun, Q., Townsend, M., Okereke, O., Franco, O., Hu, F.B., Grodstein, F. (2010). Physical activity at Mid-Life in Relation to Successful Survival in Women at Age 70 Years and Older. Arch Intern Med. 2010;170(2):194-201.